Late Jit Singh Bainiwal, Late Pyra Singh Obhi, Teja Singh and many other dedicated sevadars of the community founded the Sikh Gurdwara San Jose in 1984.The South Bay Sikh Community at that time was growing rapidly and there was an urgent need for a Gurdwara. Initially there were no funds available and Gurdwara started to rent an East Bay Community Center. After enormous obstacles, the Gurdwara Committee purchased a small building in East San Jose on White Road in 1986. Within a few months the Gurdwara Committee realized that the building was too small for Sangat. In 1990, the Gurdwara Committee purchased its first parcel of land at Quimby Road, and then bought other two adjacent parcels over the next few years, which brought the total land owed by Gurdwara to about 5 acres. 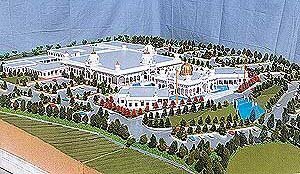 In 1993-94, the Gurdwara Committee determined that it would be too expensive to build a Gurdwara here due to City and County requirements. In 1996, the Gurdwara Committee decided to buy 40 Acres of land near East San Jose Foothills. To build a Gurdwara at this new site, the Gurdwara Committee needed at least $10 million. The Committee requested Sangat to donate generously and also give personal loans to the Gurdwara. With Waheguru’s grace, Sangat gave overwhelming and extended support to the Gurdwara Committee. As soon as the Gurdwara had enough funds available, construction started on this land in 1999 and the Phase 1 of the Gurdwara was completed in August 2004. The construction of Phase 2 Completed in April 2011 with cost of $20 million.